The AAUP 2015-2016 Annual Report on the Economic Status of the Profession. 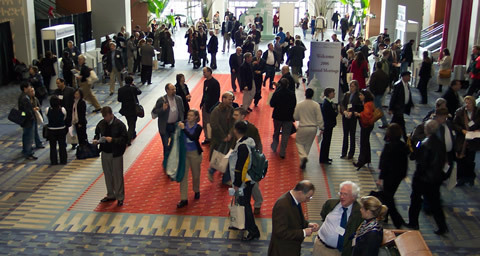 Click here for information about the Employment Center, sponsored by SBL and the American Academy of Religion, which provides the opportunity for employers and those seeking employment to register for interviews at the Annual Meetings, as well as interview facilities, job listings, candidate credentials, and a messaging service. SBL advocates on behalf of students, researchers, teachers, and others interested in biblical scholarship on issues such as secondary and postsecondary education, the academic workforce, and scholarly publishing. SBL continues to work actively with the Coalition on the Academic Workforce (CAW) Given the fact that most of the academic workforce is employed in full and part-time contingent positions, all faculty need to pay close attention to what is happening in their own institutions. The recent American Association of University Professors newsletter addresses this matter. See also the "Research and Reports" tab on the Coalition's website for in-depth articles on the history, problems, and details surrounding this important segment of our field. The Society maintains two committees and one group to provide support for certain sections of professionals: The SBL Underrepresented Racial and Ethnic Minorities in the Profession Committee, The SBL Status of Women in the Profession Committee and the Student Advisory Board. The Society advocates for all scholars through a variety of relationships with other national organizations. The latest iteration of the jobs report focuses on data from January 1, 2016 through June 30, 2017. By listing jobs with SBL, contributing professional development resources, informing members of organization activities, or collaborating on diverse initiatives, these organizations are shaping a broad and useful axis for the field. If your organization is interested in partnering with SBL, please contact us. SBL and the American Academy of Religion have eliminated all Employment Center fees for candidates. Beginning in 2015, all active members of the American Academy of Religion or the Society of Biblical Literature who have registered for the Annual Meeting will be able to register as candidates with the Employment Center free of charge. Registered candidates will continue to be able to post their CVs on the Employment Services website for employer review and will receive an onsite edition of Employment Listings at the Annual Meetings. This decision reflects our concern to reduce the cost of interviewing onsite and to make conference attendance more affordable for our members. For analysis of the number and types of jobs listed with SBL and AAR, check out the latest jobs report. The Employment Center, sponsored by SBL and the American Academy of Religion, provides the opportunity for employers and those seeking employment to register for interviews at the Annual Meetings, as well as interview facilities, job listings, candidate credentials, and a messaging service.